Nancy Lane and her husband Paul lived in Turkey while working on a construction project. While there, Nancy fell in love with Anatolians and eventually brought Gentleman Kaan's litter brother, Aslan of Murted, home with them to California. In the spring of 1988, I was living in Ankara, Turkey, working with Paul on a highway construction project jointly executed by Bechtel Construction (our employer at the time) and a Turkish firm called Enka. Our project office was near the village of Murted, about 30km from Ankara on the road to Istanbul. As our personnel drove up and down the proposed highway alignment over the months, they saw lots of "Kangal dogs" guarding sheep and goats, storming after the pickups and chasing them until they were no longer menacing the herd. Our project manager became interested in these dogs, and a Turkish contact of his offered two male pups as gifts to the project manager and the construction manager. (Aslan of Murted was the construction manager's.) The Project Manager's dog contracted parvovirus and died, so a second dog from the same litter was sent in. (This second dog was the dog that was registered as "GENTLEMAN KAAN" in Oregon and Washington.) They were claimed to be about 4 months old, which would have put their birthdays in January 1988. Aslan and Kangal (Kangal was the name Gentleman Kaan was given in Turkey) lived happily on the jobsite in a big (30'x30') fenced, concrete floored kennel with two big dog houses and service from the various workers on the site given the responsibility of feeding the dogs and cleaning out the kennel. I started working with them on leashes at about 6 months, just to spend some time with them. Kangal (Gentleman Kaan) was the alpha dog, not very affectionate and not very responsive. Aslan was a teddybear, always eager to come over for a cuddle when someone approached to scratch him through the fence. In August 1988 the construction manager left the project and did not make arrangements to take Aslan. By this time we had worked out how to import Science Diet dog food (in the containers of tires and spare parts we always had coming from the US) and I volunteered to pay for the next 800 pounds (well, they are big dogs and we wanted to deal in bulk!) So I became Aslan's unofficial owner. 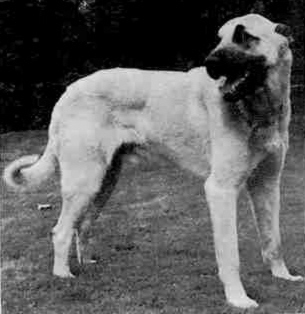 Kangal (Gentleman Kaan) was shipped to the US in January 1989. Before he left Turkey he had been pulled off a plane and kept at the airport because of the whim of a customs guard, but eventually was allowed to leave Turkey. He lived in Oregon and Washington and was owned by Bob Nevil, Woodland, WA. Special Thanks to Nancy Lane for allowing me to include Gentleman Kaan's story here! Although I obtained sire and dam information for Gentleman Kaan's litter brother, Aslan of Murted, from a pedigree I was sent (It listed the sire as Yaman and the dam as Ayibas), when I received an email from Nancy Lane, she said "I was surprised to see that you listed a dam and sire for him, since I don't have that information and never had. I brought him back from Turkey with me when I returned to the US after living in Ankara for 3 years." Therefore, I now believe that the sire and dam information from the pedigree may be incorrect! Perhaps records from the ASDCA can be examined to determine if a sire and dam was listed for this dog and, if so, from where that information was obtained? As stated earlier,Nancy mentioned that she also knew Aslan's litter brother in Turkey, where he was called "Kangal" rather than Gentleman Kaan, as he is now known in the US. Both brothers were imported to the US separately. Perhaps the people who own Gentleman Kaan have further information regarding these two wonderful dogs' ancestors.